The widest comforter on the market! If you love extra drape or are looking to fit your extra deep mattress set, this comforter is for you. Get ready to enjoy plenty of snuggle room with our supersized design. The title states it all. GRAND...the length is amazing! Ready for the cold. Imagine making your bed with a generous, cascading drape and plenty of snuggle room all night long. If you love the look of a luxurious drape or you’ve been searching for a comforter that actually fits your super king size bed or extra deep pillow top mattress, the wait is over. Our Grand Year Round Comforter is the widest comforter on the market, 20% larger than traditional comforters. 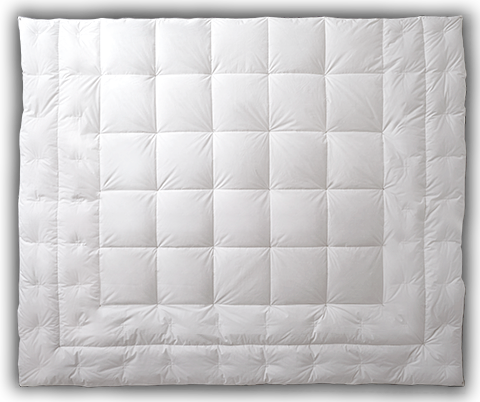 A 300 thread count 100% cotton cover holds a fluffy 550 fill power of Hyperclean® down for cozy comfort in any season. With this oversized design we've thoughtfully included an special "Double" Comfort Lock® border to accommodate the super-sizing. That together with the sewn through box design works to keep the down evenly distributed with the fluffiest down on top. Our supersized, Grand Year Round Comforter comes with navy blue cording around the perimeter for a stylish finish. Our Grand Comforter is the widest comforter you'll find on the market. At 120 inches in width, it is 20% larger than ordinary comforters making it ideal for extra-deep and pillow top mattresses as well as those with traditional beds looking for more drape. With its supersized dimensions in mind, our Grand Comforter thoughtfully combines our sewn through design with a double Comfort Lock® border to ensure the down fill stays evenly distributed and will not shift away from you while you sleep. You will notice an attractive double border along the bottom and sides of our Grand comforter. This distinctive Double Comfort Lock® three-sided border system is designed to prevent down from shifting to the edges and the bottom of your comforter by locking it into the center over your sleep area. Cross stitches within the border help to keep the down in place giving the border its fluffy, well-filled look. With the supersized design of our Grand comforter, we've thoughtfully doubled the border to be sure down isn’t wasted on the sides and bottom of your bed. Enjoy cozy warmth and comfort with this smart design solution. Dimensions are based off fabric shell before filling. Size may slightly vary.